In Stock. 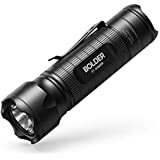 Sold by Zero Grid™ and Fulfilled by Amazon. Gift-wrap available. 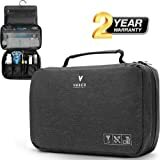 Amazon's Choice for "dopp kit for men"
DURABLE AND COMPACT: The travel kit for toiletries is made from 420D ripstop nylon that won’t fray, rip, or tear – even after years of travel. Measures 9.8" long by 5.5" in diameter. 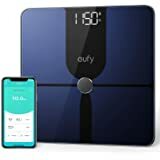 TSA Approved for Travel, BUY NOW WITH CONFIDENCE - 100% LIFETIME MONEY-BACK GUARANTEE – BUY 2+ NOW for Discounts up to 25% OFF. EASY TO CARRY AND PACK: This toiletry travel dopp kit has side straps that make it easy to carry around and hang. This ditty bag also maintains its barrel shape thanks to the piping. 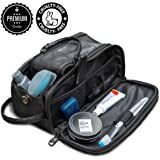 This mens small toiletry bag is the best choice for convenient travel. MADE FOR ALL USES AND HARSH CONDITIONS: This neutral-colored toiletry kit is perfect for business travel, backpacking, camping, military deployment, sport, medicine storage and more. 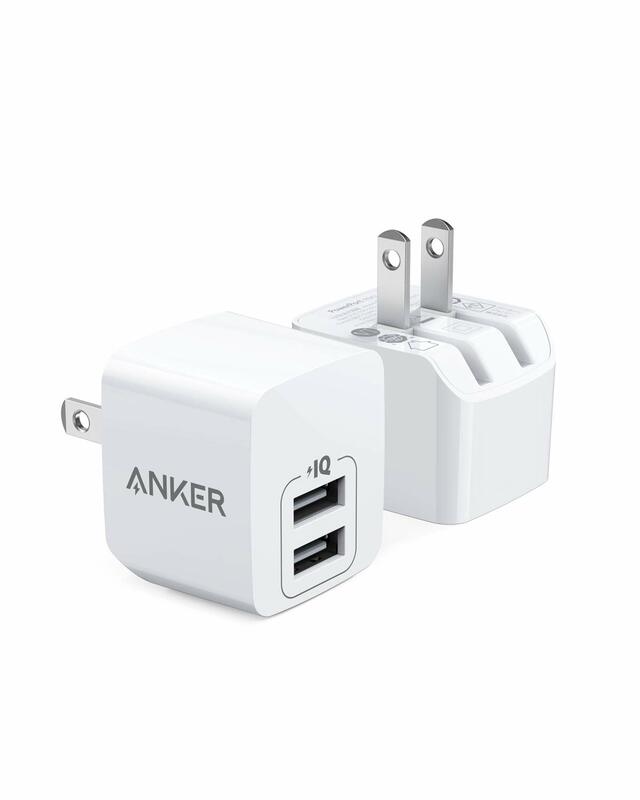 The beautiful minimalist design and durable construction make this a great travel gift. Sold by Zero Grid™ and ships from Amazon Fulfillment. Why Do Travelers Trust Zero Grid? At Zero Grid, we believe that travel can change lives. Like most frequent fliers, the pressure of ever-escalating luggage fees from the airlines and security restrictions brought on by the TSA pushed us to cut down on how much we packed on each trip. Our frequent flights to Europe, Asia, and South America moving from planes to cars to trains also made us wary of over-packing. Less is more: memorable experiences are more important than things. Durability is important. It's hard to replace a wallet or travel kit when you're in a foreign country. Nothing should be too bulky. Travel gear shouldn't get in the way. No traveler should suffer from electronic pickpocketing or identity theft. All wallets should have trustworthy RFID shielding. Value matters. Our customers should buy with confidence, knowing that the travel accessory will last for years. We were motivated to design the Zero Grid Toiletry Kit out of frustration with classic dopp kit designs. Many toiletry bags are designed just to look pretty: materials like leather often don’t mix well with shaving cream, water, or shampoo. Others are cheap and flimsy — they last one or two trips and then start to fall apart. 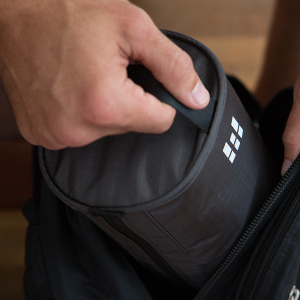 We wanted a compact and durable toiletry kit that could stand up to repeat travel. 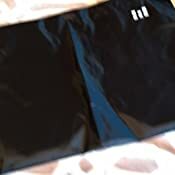 It also needed to be water resistant so it could double as a shower bag. 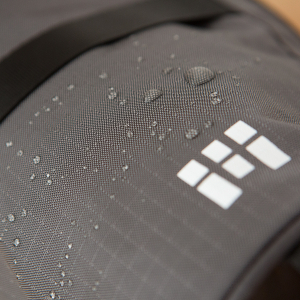 The 420D ripstop nylon construction prevents spills from spilling to the rest of your baggage. 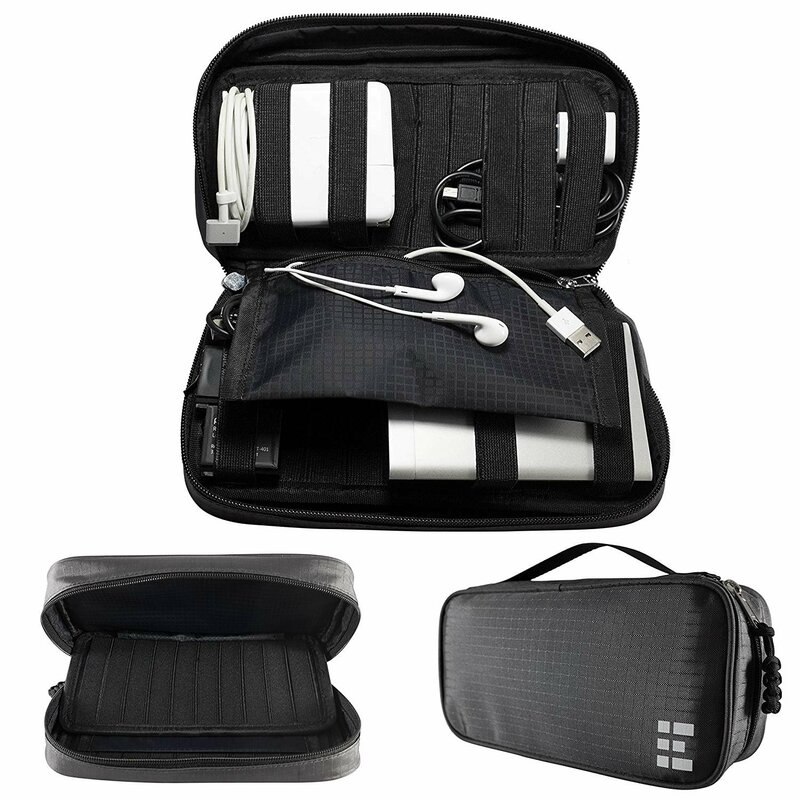 The toiletry bag contains an interior zippered pouch so you can keep an item separated from the rest of the contents. 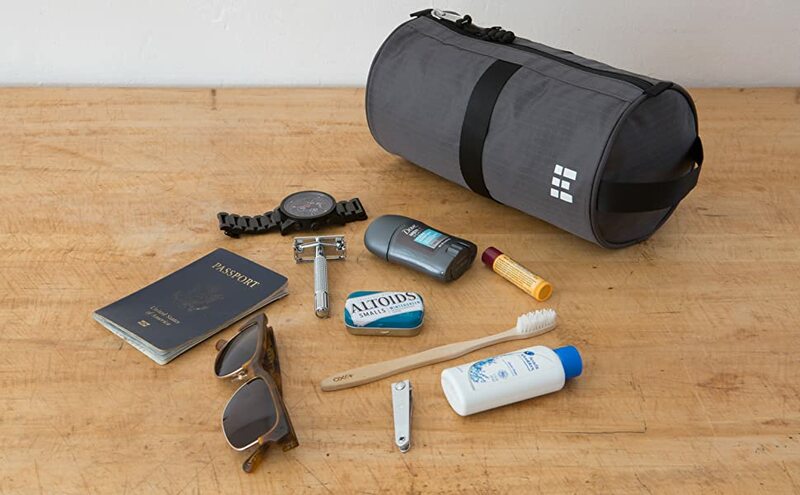 The Zero Grid Toiletry Kit is simple to pack in your personal bag or carry-on luggage. It’s 100% TSA-approved and compliant. The ‘space-age’ barreled design balances form with function. You can fit all your travel-sized toiletries with some room to spare. If you’ve been traveling with your toothbrush and razor in a zip-lock bag, it’s time to leave the plastic behind and get a toiletry bag designed for lifetime use. When you pack with Zero Grid travel accessories, it's easier to avoid all the irritation that comes with bringing more than you need with you on your trip. If your goal is to get on the plane with just a carry-on and your personal item, we want to make that easier for you. Cut down on wasted time on the security line and wasted money on baggage fees. 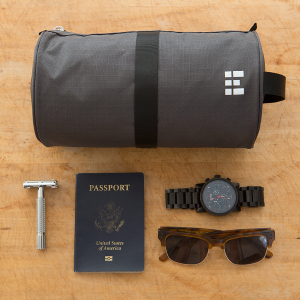 The Zero Grid Toiletry Kit makes for an unforgettable travel gift for any serious traveler. We put every product we sell through a rigorous testing process to ensure durability, visual appeal, and function. If a product doesn't meet our standards, we don't sell it. If our customers don't like a product, we take it out of our catalog. This toiletry bag is no exception. Whether you mostly travel for business or for pleasure, we want to make it easier for you to pack less and travel more. Pack your toiletries quickly and efficiently. Air travel security regulations have made toiletry packing a bigger headache than ever before. We added the extra convenience feature of side carrying handles to make removing the toiletry bag from your luggage as simple as reaching in and grabbing it. These durable EZ-grip straps also make it simpler to use it as a bathroom bag. Stop fumbling with awkward hanging toiletry kits or tiny bags that don't have anything to grab on to: our toiletry bag is easy to tote around from place to place. 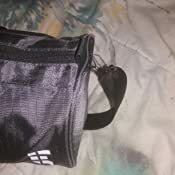 Backpackers and campers can also use the EZ-grip handles to fasten this toiletry bag to the outside of their bags to make sure that it airs out. You can also hang it from any hook when it's not in use. 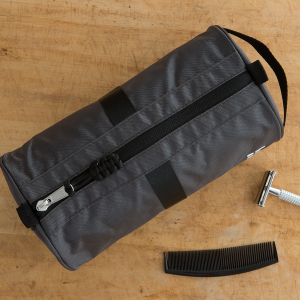 Barreled piping maintains the shape of the toiletry bag even when it's not full. 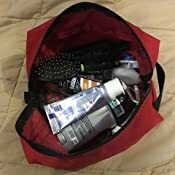 Many toiletry bags are just zippered sacks without a shape to them. When they're not completely packed to capacity, the bag loses shape. 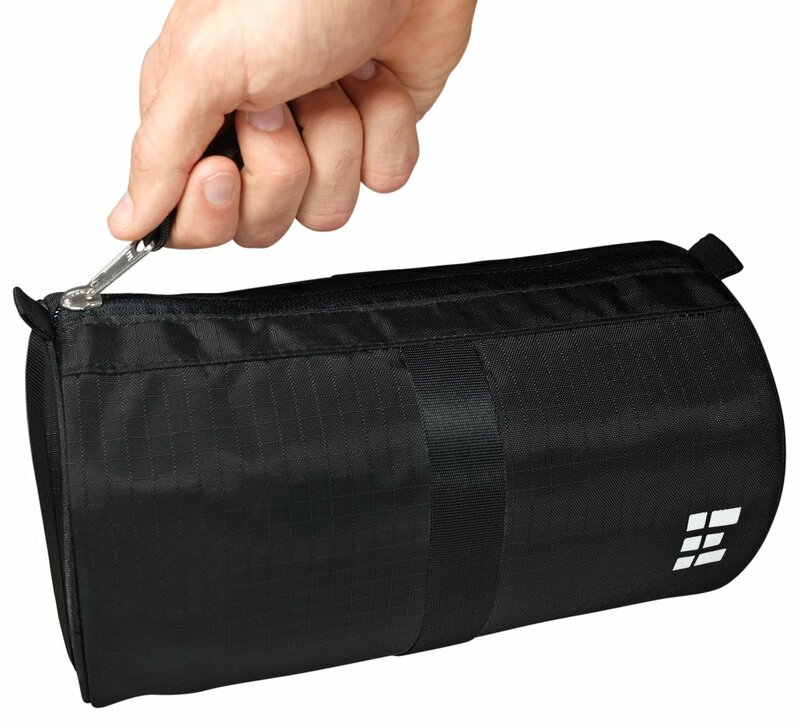 Our toiletry bag has piping so that it maintains a barrel shape even if you haven't filled it to capacity. You can find a place for it easily in your baggage. This helps you to avoid breakages and spills that might otherwise happen if items shift within the bag during travel. The inner divider also prevents your toiletries from getting jumbled when you're traveling. Keep your razor, shaving cream, toothbrush, tooth paste, and other grooming supplies organized together. 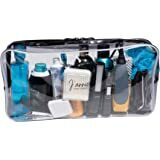 Whether you like to stay clean-shaven or want to maintain your magnificent beard on vacation, this toiletry bag will hold everything you need. 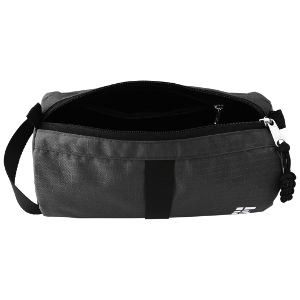 Toiletry bag has YKK zippers with large, easy-to-grasp zipper pulls. It's nearly indestructable under typical use conditions. Bring it on military deployments or camping trips. Water resistant so you can take it with you in the shower. Unlike many other toiletry bags, it's also machine-washable for your convenience. Can also be used as a multi-functional travel kit. Bring it to your office as a freshen-up-your-day bag. Use it to carry baby supplies. Pack condiments to bring with you to your next picnic. Just received this today and looked kind of small as I pulled it out of the packaging, but went upstairs to test it out and it's way roomier than I expected! Was able to fit a large bottle of contact solution, my hardshell glasses case, my electric razor, my container with my retainer, toothpaste, toothbrush, deodorant, and contacts case with ease, and plenty of room to spare! Nice heavy duty braided string attached to the zipper, and even a little zipper pocket on the inside for smaller items like pills. It's a decent size, made with decent materials and is nice and lightweight without being flimsy. No issues on quality. 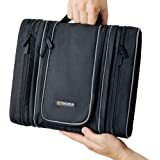 It could be slightly bigger for my tastes as I tend to bring many things with me for longer trips, but the sizing is accurately described so no points lost there - my mistake in size estimation. 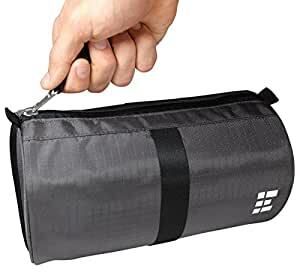 The biggest downfall of this particular bag is the opening is a single zipper in a straight line, leaving a relatively small area to put things in or take things out. This also makes searching through the bag a bit more cumbersome. With a better ingress/egress zipper opening and slightly more volume I'd be completely satisfied. 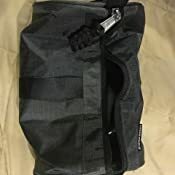 Okay so I bought the toiletry bag because I was about to head out to the field for weeks to conduct military training. I got it and was putting my hygiene items in it and I noticed that one of straps cane off as if it were not sewn in properly. The other straps were holding fine and the bag made it thru weeks of field exercisesand being packed and unpacked from my ruck sack. As its always seems to happen one of the straps broke off as I was hanging the bag up to shower. 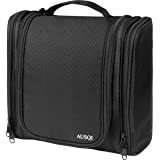 The bag itself works great and holds a lot of things neatly and organized. So if you want something sturdy to hold your hygiene items this bag will do just that. This is a very well made product. I backpack and camp plus travel quite a bit for work and pleasure. Was actually looking for a second Dopp bag to either throw in my trunk for after golfing (there is a shower at the course) or one that was slightly smaller for travel. This fits the bill for that. Lightweight, well made and holds a lot. 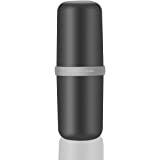 The only issue I see with this one is because of cylindrical shape the sides fall in onto the zipper area when open and you need two hands, plus it doesn't open up enough so it's hard to find what I'm looking for. See photos of the Zero Grid and my old one which I have no idea of the brand. I'm keeping it anyway, but its not perfect. 5.0 out of 5 starsThick material and steardy zipper. Great product. Material is thick, rip-stop with a steardy zipper. Has enough room to keep all my daily toiletries in and a little more. The inside zipper pocket isn’t large, but is big enough to slide a toothbrush in, if needed to; I used it for my safety razors. The bag packs away nicely in my travel bags. I’m able to sit the bag nicely and pick around it with no problems. The many handles all over the bag make it easy to hang for storage in wall lockers. All and all, it is a great value for your money. I would buy from the manufacturer again. I am very happy with this. You can stuff it and it is still very easy to pack. It is true that if you have it really packed up, you may need to remove a couple of things to be able to spot something you are looking for, but by the nature of the item's shape, that is unavoidable. I would recommend it. Very simple but well designed bag. I'm an average guy. 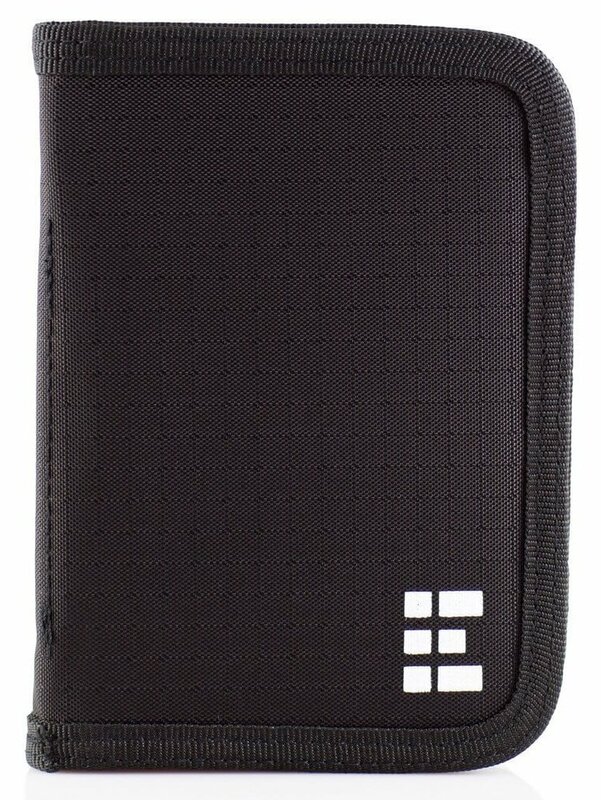 I carry my toothbrush, toothpaste, beard trimmer, shaving cream, razor, pills, and more in this with plenty of space. I travel alot for work and it fits perfectly into my weekend bag along with my other necessities. It's made of good material. I would recommend this bag to any modern guy.